Cosrx Ultimate Moisturizing Honey Overnight Mask Review - First 2017 Empty! That's it. 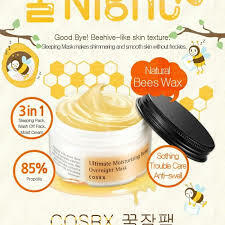 I finally finishes off my Cosrx Ultimate Moisturizing Honey Overnight Mask (that's a mouthful) today. Spoiler: I really really really like it. I bought this sleeping mask from Hermo, and it costs me about RM45. What it is: The Ultimate Moisturizing Honey Overnight Mask is a gel type sleeping mask that acts as an occlusive to prevent your skin from losing its moisture overnight. You just apply a sleeping mask as the last step of your nightly skincare, and rinse whatever residue left the next morning. Cosrx also marketed this product as a 3 in 1 beauty product, so apart from using it as a sleeping pack, you can also use it as a daily moisturizer and a wash off mask. What it claims: This soothing sleeping mask is enriched with 85% propolis extract and natural beeswax to provide intensive hydration and moisture. The gel comes in a 50g jar, but there is no spatula included. For hygienic reason and easier application, I decanted the gel into an airless pump (vacuum pump) bottle that I bought from Daiso, and recycled the tub after people reported that their gel grow mold at the rim of the tub (eek). The gel is in translucent yellow, very lightweight and does not has any strong smell to it. It is not sticky at all and quite soothing when applied. I actually had finished a jar of this sleeping mask and it takes me about 2 and a half month of consistent use (almost every day) to finish it all. To use it, I spread it on my face thinly and as even as possible as the last step of my skincare routine. It dries pretty fast after 15 minutes or so, and then I just go to sleep and when I woke up, most of the products are absorbed and I just wash off the filmy residue the next morning with some water. Notable ingredients: This sleeping mask boasted 85% propolis extract, which has anti bacterial and anti microbial properties that repairs skin texture and smooth it out. 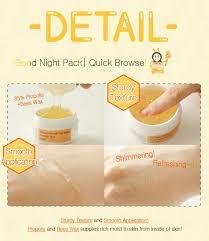 This sleeping pack also contains beeswax that helped to prevent moisture losses and moisturize skin. Although the sleeping pack has Honey in its name, it contains no honey at all and probably just to refer to the color of the gel and the "honey" skin goal that it is set to achieve. How it performs: My face is noticeably plumper the next morning. Since I have a combination skin, the skin in between my eyebrows sometimes flakes off and I got some oiliness going on my nose and its crevices. I found that those flakes disappears and I am less oily if I wore this before going to sleep the night before. I have used this as a moisturizer before my makeup and I think it works great too as it is very lightweight. However, if your skin is very dry, this product might not be sufficient. I heard that the Cosrx Rice Overnight Mask is better suited if you're looking for intense moisturizing sleeping pack. I haven't use this mask as a wash off pack because it dries down quickly and it will be a waste to wash off a lot of the gel. Overall, I'm really happy with this sleeping mask. I will gladly be repurchasing this sleeping pack in the future, although I am still testing out other sleeping masks out there. 8/10 will recommend! Ah, this sounds like what I need. No need to worry about falling asleep with my mask on anymore! Whoa for 3-in-1 products this is an awesome deal! I would like to try too and see the results :) Thank you babe! You make me wanna try this out. Love Cosrx products. But I have not try this one yet. Wow glad it works well on your skin. Is it applicable to acne-prone skin? I would love to try this. Thanks for your review. I would love to try this, honey is suppose to be really good for the skin and scars. it seems like a good product. will try out in future. I normally will use the Laneige one, but since I read your recommendation, I would love to try this later. yer it will grow mold?yucks..im trying out nature republic one...quite good also but still prefer laneige ones.. It didn't grow on me, probably the person didn't use it for a long time but still.... I'm trying out Laneige now! Never tried sleeping mask before, usually I will just wear mask during daylight. Thanks for this blogpost, will tried this product soon! Seem a good product. i want get this mask too as i have combination skin too. thank you for recommending this babe!!! do you know any similar ones but for the eyes instead? I'm using this brand but haven't try on this products yet. Will check it out soon. Love your review and looks like a really good product! I bet honey on the face it was really cooling and moisturizing too. wow propolis extract!! :O Definitely need to try this out! This looks very hydrating. Im actually impressed how moisturising it looks, that im convinced. Putting honey on my face has really made my skin improved. Hi! If I use it as a sleeping pack, should I use it everyday?